Just back in the UK from the Partners in Harvest & Catch the Fire 20 year celebration. 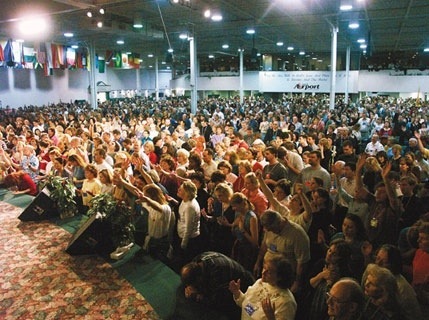 What started out as an incredible Grace/Holy Spirit outpouring at the Toronto Airport Christian Fellowship (Now known as Catch the Fire Church Toronto) has become a global movement of thousands of churches and tens of thousands of revivalists in many many nations. I remain completely amazed how this fire of God is spreading unabated in so many different places. We heard revival reports from Russia, China, Southeast Asia, India, Europe, North America, and many nations too sensitive to mention by name. 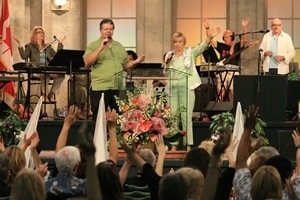 In one church alone in Russia there have been 30,000 documented and reported healings. I believe one of the main reasons for this continual outpouring is the honour with which we host the presence of the Holy Spirit and the centrality of the word of God and the gospel of Jesus Christ. Truly a word and spirit fusion which is causing spontaneous growth around the world. When this is combined with a humble dependence on the Holy Spirit and the healing of the emotions, soul and spirit in the Father’s love it becomes a sweet smelling fragrance of adoration and love going up to The Lord. It is very true that this is only one small expression in the wider Body of Christ with its 2 billion Christian members, but I believe it is a sweet smelling and precious thing in the sight of Jesus and a healing balm in the body of Christ for the sake of the nations. In apocalyptic language, John the beloved apostle of Jesus shares in but a few words the whole story of humanities fall from relationship with God in the motif of our weeping, our utter unworthiness to effect our own righteousness or salvation in the sight of God’s holy majesty. A search is done of ‘the Great and Good’ but nobody was found who is sinless and perfect. Hence, nobody can open the scroll of life for the names of the saints to be added. With perfect literary tension an ‘elder’ comes into the scene: but wait… who is this? Look! the One who fulfils the hope and longing of all peoples and ages , the One who defeated death and rose victorious – Jesus Christ has come. Once and for all time he has dealt with the just penalty of sin by removing the sting of death for all who believe. Heaven erupts with the joyous chorus! 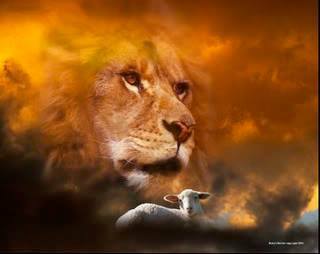 The Book of Revelation pulls back the curtain of time and space and peers into the more vividly intense drama of heavens great song and human kinds redemption. What hope and joy awaits us and fills us even now as we trust in Jesus. 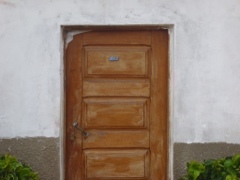 I took this photograph of this door at a youth project in Mozambique. I love this picture. It is an old dusty door with a singular word ‘Jesus’ as you can see. It reminds me that many people will pass the door by and not notice that this is the ‘Jesus door’. How true in life. Jesus said: “I am the door”. I wonder how many of us really notice him in the business of life where we frantically look around for meaning and purpose – the very things that he has to offer. Make sure you try the Jesus door – you may to be surprised what you find hidden on the inside!